Thomas Buchanan directs the Delaware Rehabilitation Institute, which has been awarded a five-year COBRE continuation grant totaling more than $5.4 million for osteoarthritis research. 9:23 a.m., Aug. 3, 2012--The Delaware Rehabilitation Institute (DRI) has been awarded a five-year COBRE continuation grant totaling more than $5.4 million for osteoarthritis research. Supported by the National Institutes of Health, COBRE grants are aimed at expanding and developing institutional biomedical research capacity by enhancing research infrastructure. 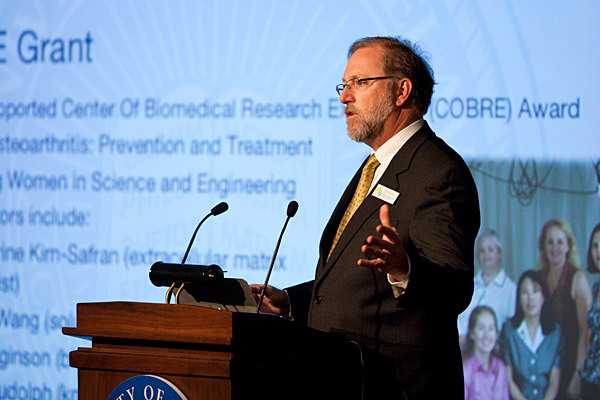 The University of Delaware has had a COBRE program focused on osteoarthritis (OA) research since 2001, with contributions from researchers in the colleges of Health Sciences, Engineering, and Arts and Sciences. UD’s multidisciplinary, multi-scale approach to the study of OA involves faculty doing work in extracellular matrix proteins, biomechanical modeling of joint forces, and clinical outcome studies. Clinical researchto facilitate clinical trials through patient database access and biostatistics support. In addition, the program will include an important mentoring component.